I have this hanging on my wall. It reminds me of the lab I used to have. I heart labs. Yes, I admit it. I do. And I’m not embarrassed to share my deepest feelings about them here on my blog. I’ve had labs most of my life. A couple of black ones when I grew up. And a chocolate lab who lived 15 years and survived a rattlesnake bite, the eating of several pounds of Hawaiian chocolate (the fact she swallowed them whole with wrappers on saved her life), a bad reaction to a medication for arthritis, and the first shot the vet gave her to end her life. She fought to the last possible moment when the vet, red-faced, had to inject a second dose. Now we have a yellow lab, which was supposed to be a black lab, but my wife and daughter used mind control on me when we visited the breeder looking at puppies. Somehow we left with a deposit on a yellow. To this day, I’m not sure how that happened, how I gave in to them on that decision. But when I look at the four-year-old yellow lab sleeping at my feet, I’m glad I did. She’s perfect. But that’s not why I’m writing this post. 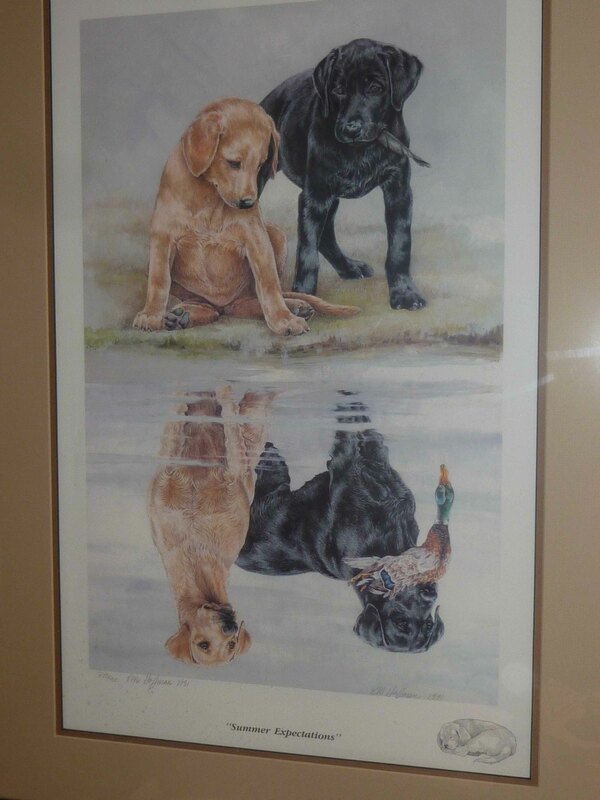 Why I’m writing it is because I have three framed prints of Labradors in my office. 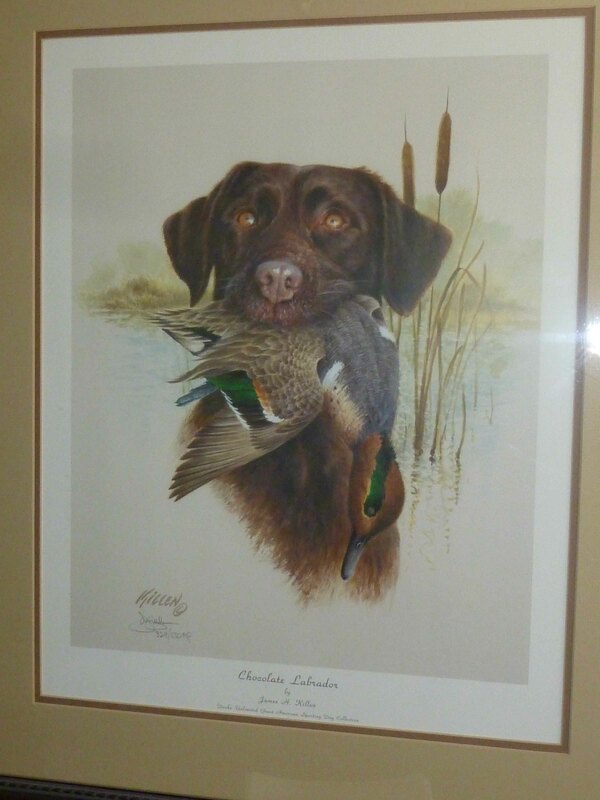 Two of them are paintings of hunting labs, manly dogs. But then there’s a third poster – one slightly off-kilter. There are no shotguns in the painting, no testosterone-laced hunting scene in the background to make me feel better. I look at it and wonder: What was I thinking when I picked out that one? I thought it was a good use of my money? Really? I fear digging too deep in my memories to dredge up any deep thoughts about its purchase. I understand the simple theme of it: Lab pups dreaming about growing up into adult labs. Ebony and Ivory - can't you just hear that song playing in your head all it the time. I do. But most of all I wonder about myself and who I was when I saw it in a catalog and felt the overwhelming need to use what money I had at the time and order it. I look back on my life now and thing of the all the cash I’m spent on stuff I had to have, much of it discarded or something you’d sell at a garage sale for a couple of dollars. I struggle with the question of value and consumerism all the time. But now I look at the print of the two labs again and I can feel the testosterone draining from my pores. I like the print. It makes me feel warm inside like when I drink hot chocolate and wrap myself up in a quilt and read the latest trashy romance novel. Hmm, that sounds good. Ooh, I have goosey bumps just thinking about it. How sweet it is. I HAVE LOST MY MIND. WHAT IS WRONG WITH ME. DAMN, THIS BAG OVER MY HEAD GETS HOT. Sorry, I plead momentary insanity. That is the power the print has over people. Question it not. Here’s something more embarrassing. I used to own a Labrador t-shirt with an image of a large chocolate lab head on it and “Chocolate Labrador” printed under it, as if one wouldn’t recognize the disembodied head of a lab. I think it went to Goodwill several years ago. I won’t be surprised if sometime in the future when I’m homeless and pushing my shopping cart down Ventura Blvd, black lab on a rope next to my side, I’ll see a fellow man of the streets pushing his cart toward me. He’ll be wearing my old lab T-shirt. And we’ll give each other a nod like only dudes do. No words will leave our lips, but we’ll know. Yeah, we love labs. Yes, yes we do. This entry was posted in Dogs, Fun & Humor and tagged Fun, Guy Stuff, Labrador Retriever, Pets, time by unknowncystic. Bookmark the permalink. Those shirts have actually come back in style. If I still had it, I’d wear it with pride. Life is good with a lab on your chest. I was happy to see your new post yesterday. I haven’t had time to leave a comment because I thought it was a really interesting post – complex – and I haven’t been able to figure out what to say. I hope the words come to me soon. Your ER visit felt so familiar to me. I’ve felt so out of place there so many times. 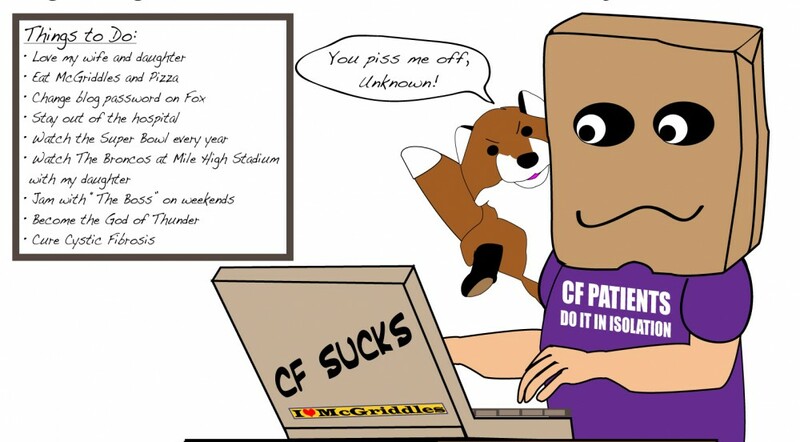 They always do a chest x-ray due to the cf. SOP. Best to all of you. And I know the IVs will work with Natalie and she’ll feel better.